The Palisade is the most detailed and intricate of our models. 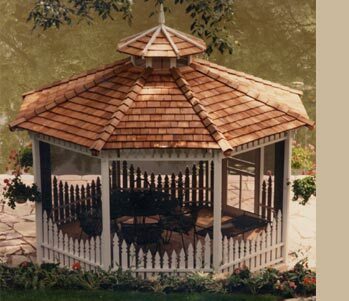 Playfully surrounded by pickets, this spaciously designed gazebo maximizes interior space and is perfect for furniture groupings. When complete, it will become a sanctuary where you can entertain friends and family, or just escape the rest of the world. The charming details and ornamentation of this 13 foot Palisade, placed on the edge of the homeowner's lakeshore property, draw the attention of passing boaters and the admiration of next-door neighbors.